I go through phases. This probably isn’t any different from anyone else who does something creative. There are no double periods when someone really feels like playing jazz on the piano or when someone really seems to be into crocheting hedgehogs. I, on the other hand, seem to fall into patterns where a specific paper doll theme seems super fascinating to me. During this stretches, I often add images based on the theme to my pinterest boards with abandon. About half the time, these spasms of interest don’t actually lead to paper doll outfits, because I have the attention span of an ADHD raven sometimes. However, on occasion, they do. So, after a few weeks of being really into Tudor influenced fantasy clothing, I actually drew some for the Sprites paper dolls. See? There was a point to that weird ramble that I started today’s post with. If you hop over to my Pinterest fantasy board, you will not doubt notice the large number of Tudor influenced dresses there. A few of the ladies dresses that inspired me are this one, this one and this one. I also really liked this men’s doublet and this men’s doublet. The lady Sprite outfit is really only fantasy, because I couldn’t be bothered to do any real research and I refuse to call something historical unless I actually have sources I can cite. The guy Sprites on the other hand… well, that outfit has a lot more fantasy going on. I just think a lot of men’s clothing from the Tudor period looks pretty absurd. What can I say? Love the blog? Become a Patron. It really helps. Yesterday I posted fantasy garments based on some traditional Asian attire. Today I am hopping back to Europe to post a riff on 15th and 16th century dress. Today’s Marisole Monday & Friend’s paper doll dress crosses Italian clothing in the late 1400s with English costume in the mid-1500s. There’s a definite Spanish Farthingale thing going on in that skirt shape. Spanish Farthngales were hoop skirts of their era and gave dresses a distinct cone shape. It was all the rage in England towards the end of the 1500s. Here’s an example of what I talking about. The sleeves of today’s paper doll gown are pretty Italian. The style in Italy at the very end of the 1400s and the beginning of the 1500s. It was considered fashionable to have the shift sticking out through the spaces the sleeves- my paper dolls are nothing if not fashionable. Here is an example of the sleeves I mean and here is another one. 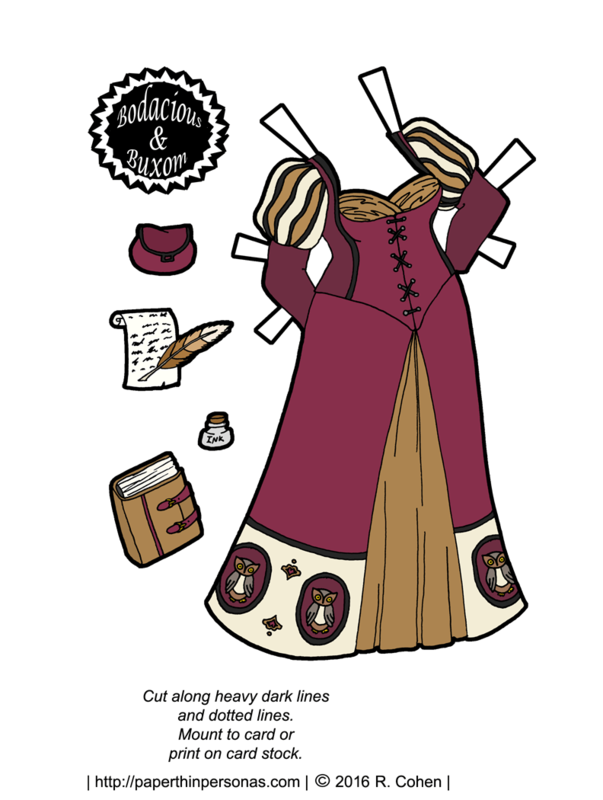 When it came time to color today’s paper doll, I fell back on the colors I tend to like when it comes to Tudor feeling things. I settled on copper and black for the color scheme. While I experimented with brighter options, I loved the sophistication these colors created. As with many of my fantasy paper dolls, I added shoes and stockings to round out the outfit. After all, I do love to draw shoes. These shoes are neither English nor Italian, but more a pair of modern ones. So, that continues the cross-cultural experience here. 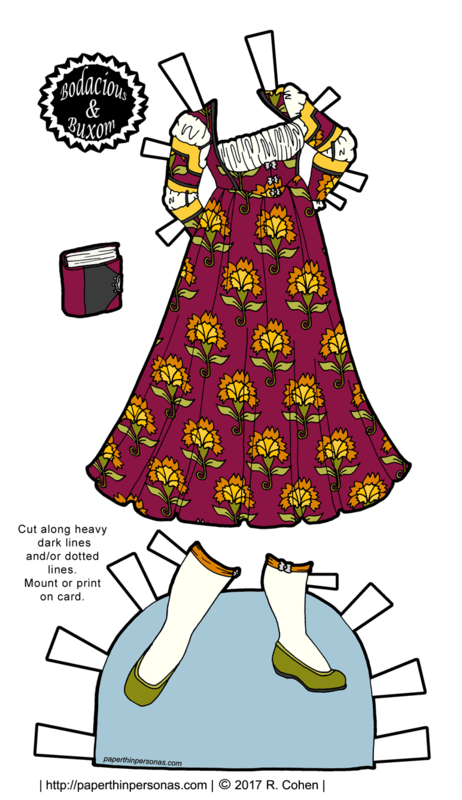 So, what do people think of my English-Italian Renaissance love child of a paper doll dress? Leave me a comment and let me know. Meanwhile, if you want to support the blog, then think about donating through Patreon. 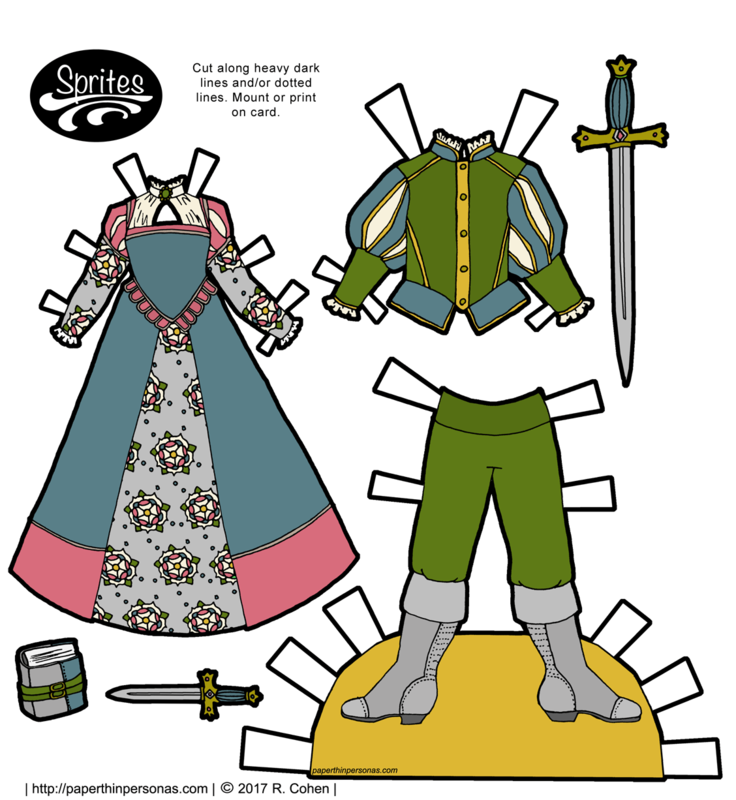 Today’s paper doll costumes are a pair of renaissance inspired fantasy outfits with an elaborate fish pattern on the gown. 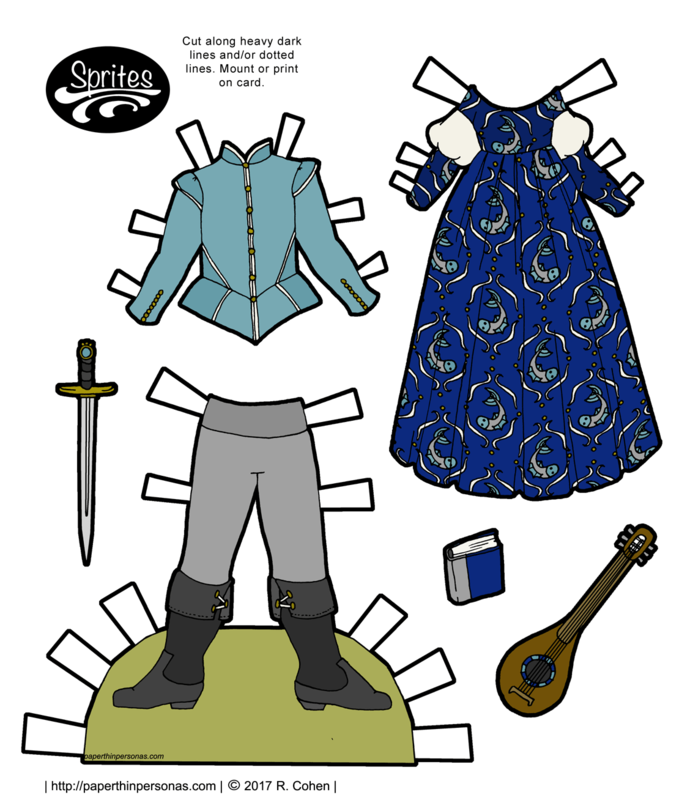 In today’s renaissance fantasy paper doll fashions, I gave the Lady Sprites a blue and white dress. The Gentlemen Sprites a pale blue and grey outfit. Rather than giving the Lady Sprite shoes, I opted to create several accessory pieces including the instrument, book and sword. I don’t have a lot of say about these paper doll outfits. I drew them. I had fun drawing them. I’m actually super-duper proud of how that stylin’ fish pattern came out. But honestly, that’s about it. After writing yesterdays long post about Snow White, I feel sorta odd that all I can say is that I picked blue and I liked fish. And I will say that I think fish are a super cool motif. They’re a wonderful shape and I really enjoyed drawing my fish, but that’s kinda all I got. Not the worlds most insightful post, but they can’t call be. There’s still my Reader2017 coupon for 25% off still running in the Etsy store until the end of the month. And the blog has a facebook page now, so go there, like it, and spread the word about the fun of PTP! 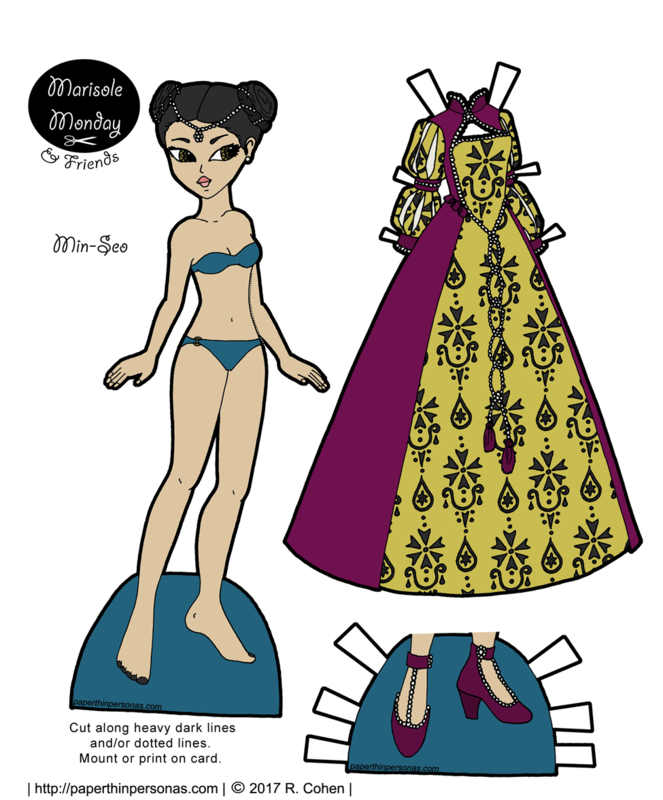 Today’s Printable Paper Doll Inspirations: Athena- Goddess of Wisdom, Renaissance Faires, and This Paper Doll I drew in 2013. Yesterday, I posted my big beautiful brown skinned fantasy maiden B&B paper doll with some rockin’ boots and I explained how that paper doll set was inspired by a project to look again at older sets on the blog and use them for inspiration for newer sets. 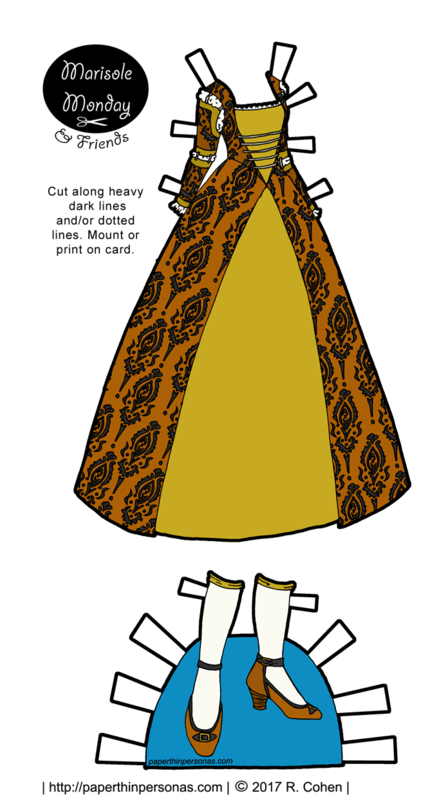 Yesterday’s paper doll and today’s gown were both based on a Pixie paper doll set called Dionisia. Athena, goddess of wisdom in Greek mythology, inspired the trim on the bottom of her dress. Owls were the symbol of Athena and I wanted to give a nod to the goddess in this gown. In the Renaissance era, which was a minor inspiration for this gown, ancient Greek myth and legend was super popular, so the owl motif is also a nod to that. Plus, it was an excuse to draw some owls and who doesn’t want to do that? My natural instincts told me to make the undergown cream as I did with Monday’s paper doll gown, but I fought those instincts and went with a deep gold instead. Since the gown is trimmed in a nod to Athena, I decided that this gown was worn by a woman of education and distinction. Therefore, she got a pot of ink, a scroll and a book as her accessories. Seriously, that’s why. It has nothing to do with my love of drawing books. Honestly. Tomorrow, there will be a ninja! Also, I hope all my USA readers take the time today to go vote. Super important.